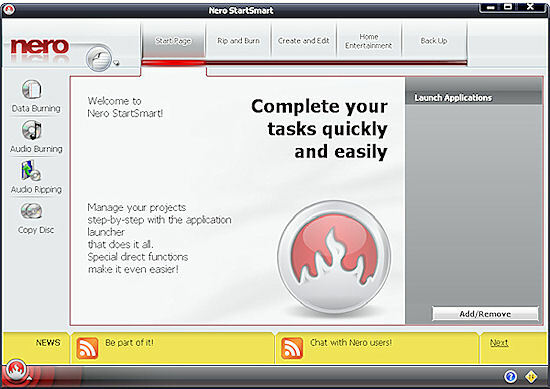 The new version of Nero has grown in size and requirements from its predecessors. Whereas Nero 7 would only need Windows 98 or better running on a 800MHz Pentium III processor with 128MB of RAM, Nero 8 needs Windows 2000 SP4 or later. On top of this you will need a 1GHz Pentium III processor, 256MB of RAM (512MB for Vista), 1.5GB of available hard disk space and DirectX 9.0C or higher. Installation still seems to take ages, even using the default settings. InCD, the packet writing software, is still not included by default, which has been the case for some time now. It can conflict with other software, and with the price of discs so cheap, the ability to drop files onto a CD/DVD like a hard disc seems a bit old fashioned. The Start Menu shortcuts have been changed to show just the applications in the program folder, then a sub menu for the toolkit apps (all eight of them, including the new Rescue Agent), and the manuals. All but three are help files and the remaining three out of the nineteen listed are PDFs. The main application, Nero BurningROM, hasn't really changed at all. There's a new overlay animation when you start the program, and the icons have changed in the program itself, but it works pretty much the same way. When using RW discs, Nero always checks if the disc is empty and offers to erase the data if it is not. There is a Quick or Full option, but when you are burning a disc, it uses the quick one. It makes the process very easy as it handles the disc for you, wiping it before burning the new data. One of the many small niggles with the software is that creating a disc image still only gives you the option of using the Nero's NRG format. You can load and write standard ISO images to disc, but unlike many other CD programs you cannot create your own ISO images. The log file after burning a disc doesn't say how long the process took. The progress window has an estimate, but it would be nice to know exactly how long it took. The log is shown in a window underneath the burning completed dialog, but I couldn't find a way of permanently switching it off. There is a detail button that will hide it, but as I tend to verify the discs I burn, I rarely need to see the log. 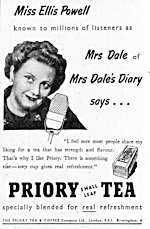 Some of the programs have had very little change. The Back Up program has a few more file filters and encryption algorithms but other than that there is no difference between this and previous versions. The Cover Designer has some new templates but the bug of showing incorrect size of files and folders when creating a Standard data disc booklet with a template is still there. Nero Express looks different, but functions exactly the same, giving a simple way to access the main features of BurningROM application. The program that has seen the most change is Nero StartSmart. 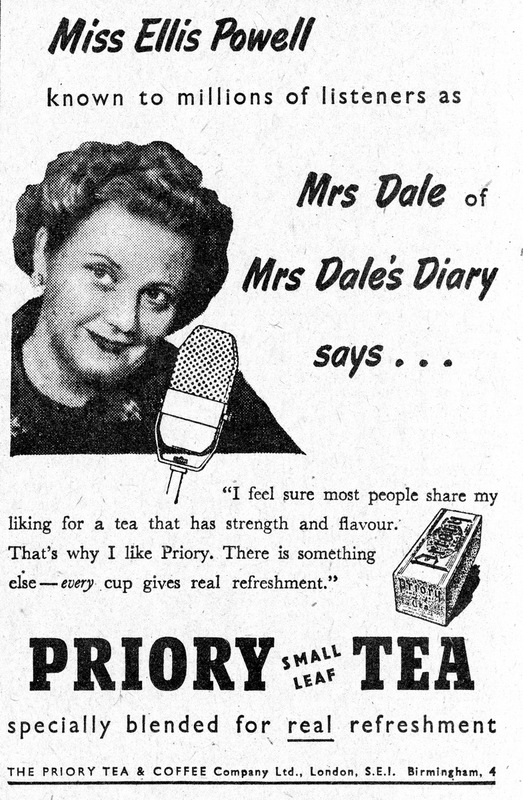 Previous versions relied on the front-end interface to steer users to the appropriate component program. There were problems as you had to double back if you chose the wrong path. The redesigned SmartStart incorporates some common functions. You can now rip audio files, copy discs, and burn audio and data discs without having to leave the navigation aid. The options are better organized and easier to access. Shortcuts to the frequently used applications in the collection are helpful, but when you use SmartStart you have fewer options. If you want to use all the whole options available you should use the full programs. Nero Home looks and functions like Windows Media Center, but does not require a Windows Media Center PC to run as the host. A wizard leads you through a set-up process that includes selecting your country, language, background appearance, font size and any television/radio tuner that is identified by the program. You will then need to let the software scan your system for various types of media files and channels detected by the tuner if you have one. This process is rather time consuming but does need to be carried out in order to gain the full benefit of this software that can manage home entertainment needs by playing, cataloguing media files and offering search capabilities. Additional tools available in Nero bundle give the user a chance to test the health of the disc drives with DiscSpeed, reduce noise of the drive with DriveSpeed, assign which users have burn rights with Nero BurnRights or learn the insides of your computer with Nero InfoTool. 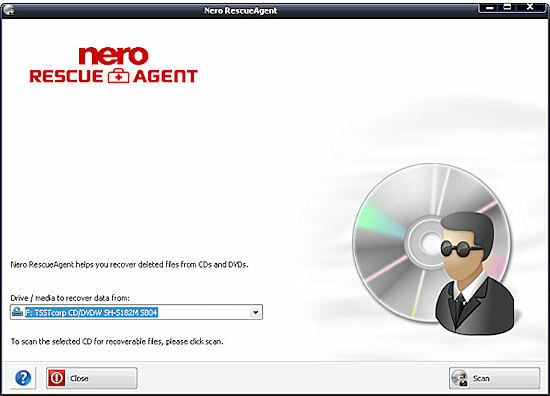 Because the new data-recovery tool, Nero RescueAgent, is a toolkit utility, it is inaccessible from SmartStart, as are all the toolkit applications. The program can recover files that were incorrectly or incompletely written to a CD or DVD. Through a very simple interface, you select the drive with the damaged disc, choose the files you want to retrieve, and select the directory to which you want to save them. With multi-session discs formatted using a packet-writing UDF file system, you may also be able to recover older versions of the deleted data. DVD creation is available in Nero BurningROM and Nero Recode deals with manipulating them. All the options have remained the same so you can recode a DVD to DVD, recode only main movie (DVD movie ripping), compile a DVD with DVD files on your computer or recode DVD to MP4 format. Although Blu-ray and HD DVD playback isn't new to Nero (it was introduced as an upgrade to version 7), the company has broadened its support. If you have a Blu-ray recorder, you can create a BD-AV (Blu-ray Disc Audio/Visual) disc encoded with DV or MPEG-2 video files. You can then play the BD-AV disc either on your PC by using the included Nero Showtime component or on a standalone Blu-ray player. 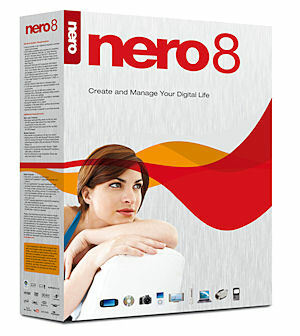 Nero 8 can also burn Blu-ray data discs. The video editor in Nero Vision is fairly basic. You're limited to just one video and two audio tracks. This latest version of Nero Vision is also YouTube and MySpace friendly. Enter your log-in and password and you can easily import or export video files from within Nero Vision. It is no substitute for a full video editing program, however. 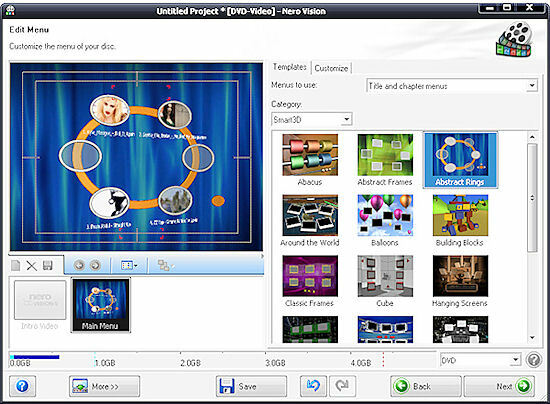 The 2D and 3D menu templates help you create and burn video CD and DVD projects. The 3D menus are impressive but you have to remember that they take up quite a bit of room on the disc, leaving less space for your video files. You can quickly preview how the 3D menus would interact with your video files by using Nero Vision's simulated remote control (which resembles the remote that ships with standalone DVD players). Apart from the interface change and SmartStart, there only seems to be the odd tweak here and there. The installation is still a mess, taking far too long to install. I had problems with file associations changing for video and graphic files, as Nero wants to handle everything. I'm happy with Media Player playing the videos and my graphics programs looking after my pictures. Media Player can also rip music from CDs, so that's another function Nero didn't need to include. With all the extra templates included, the installation disc is now a DVD rather than a CD (there's around 990MB of setup files). Printed documentation is sparse; you get a few pages of set-up instructions in the multi-language Quickstart Guide, but for more detailed information regarding the various applications, you need to access one of the many on-line manuals installed to your hard drive. If you don't have any video, graphic or audio programs, and you don't have any of the previous versions, then Nero 8 can provide everything you need. However, if you have older versions of Nero, in particular version 7, there is little point in upgrading.